The Swift Windsong is powered by only one engine option, which is the tried and tested 1.3 liter Multijet diesel. 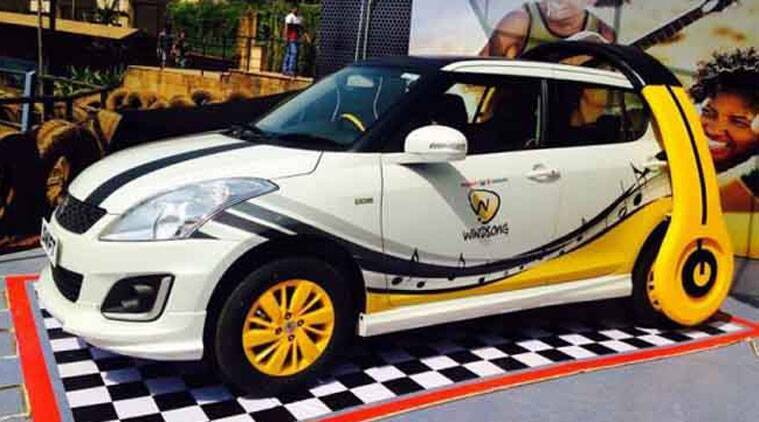 Shortly after launching the face-lifted Swift, Maruti Suzuki doubled the anticipation by unveiling a limited edition variant of the car – Swift Windsong. Exclusively designed for music lovers, the ‘Swift Windsong’ is essentially the regular Swift with fancy decals and accessories. The car has been showcased at the ongoing ‘Windsong Music Festival’ in Lonavala, Maharashtra. To be available in only one variant with diesel engine, Maruti Suzuki will be producing only 100 units of this limited edition version. As said, the ‘Swift Windsong’ is basically the standard model with groovy graphics plastered on the outer body and few add-ons. On sideways, the car comes with tri-colored musical decals, which run all the way from the front headlamps to the rear tail lamps. Two vertical black stripes mark their presence on the front bonnet. The roof, just like the A and B-pillars of the car, is finished in black to accentuate the sporty appeal of the car. The car is kitted out with side skirts and yellow-colored 15 inch alloy wheels. Inside, the new ‘Swift Windsong’ welcomes you with the same all-black interiors, along with yellow accents on steering wheels and silver accents on dashboard. Keeping the music ethos of the version intact, the car comes equipped with a 2-din stereo system, accompanied with USB, Aux-In and Bluetooth connectivity. Apart from these changes, the ‘Swift Windsong’ includes all the new additions which made their way with the Swift face-lift few days back, including redesigned bumper, silver fog lamp inserts, electronically folding mirrors and push button start-stop. The car will be offered in only one paint shade of white, owing to its exclusivity. Mechanically, the Swift Windsong is powered by only one engine option, which is the tried and tested 1.3 liter Multijet diesel. Paired to a 5-speed gearbox, the engine is capable of belting out 75PS of power and 190Nm of torque, as well as delivering a class leading fuel efficiency of 25.2 km/l. Though Maruti Suzuki has kept the prices of this exclusive variant undisclosed, it is expected that the company will charge a premium of around Rs. 30,000 to 40,000 over the regular Swift for this car.